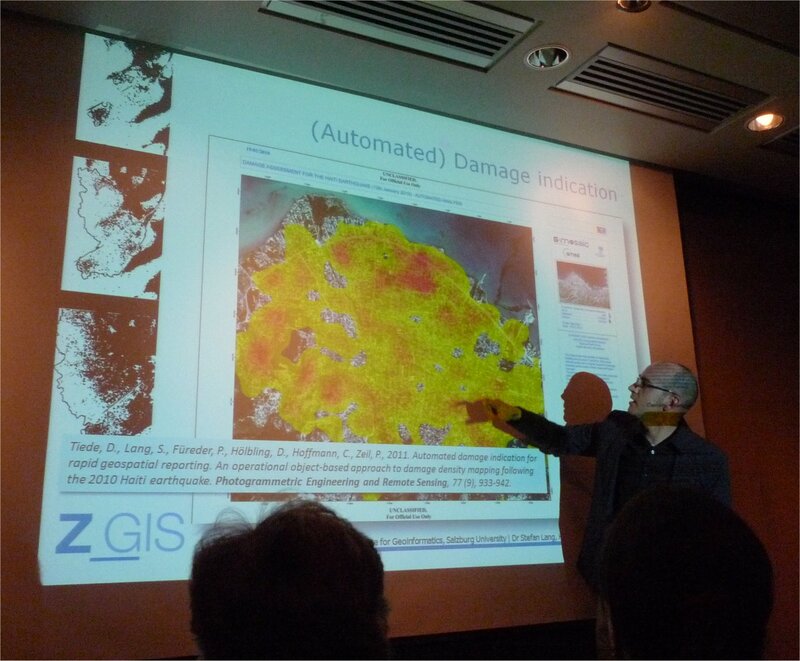 Following an invitation from the Loeb Fellowship Program, Dr Stefan Lang, Head of Z_GIS Research, gave a talk at the Harvard Graduate School of Design (GSD), last Thursday, March 29. His presentation entitled “Image to information – new viewpoints on global challenges” gained a lot of attention among architects, planners, and journalists dealing with issues of sustainability, participation, and social engagement. Dr Lang showed outstanding results from Z_GIS research activities with a focus on image exploitation and Earth observation in the humanitarian and disaster context. 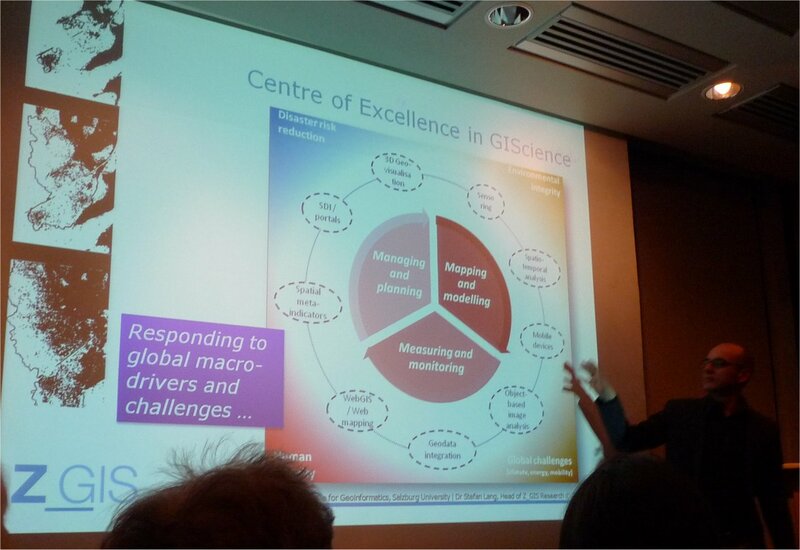 He highlighted the importance of assembling GI processing workflows and image analysis techniques for addressing global challenges with an efficient suite of tools. Likewise he emphasized the crucial role that a constant interchange would play with those who are in need of such information, like humanitarian organizations or the UN. In the current academic year Dr Lang joins the Loeb Fellowship Program at GSD, Harvard University, as an affiliate enriching his research experiences in sustainable spatial planning and management, GI in disaster response and humanitarian action. Cut off is 26th of April 2012. 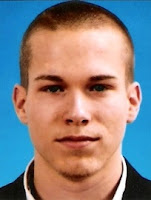 Z_GIS is proud to announce the recipient of this year's 'Student of the Year' award: for his BSc paper "Implementation of Autocorrelation-Based Regioclassification in ArcMap using ArcObjects", Christoph Mayrhofer has received the annual University of Salzburg Esri Development Center distinction - congratulations!! 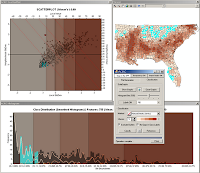 Based on a research paper on a newly developed approach for cartographic classification of choropleth maps, Christoph Mayrhofer implemented and extended the proposed method as an Add-In for ArcMap. 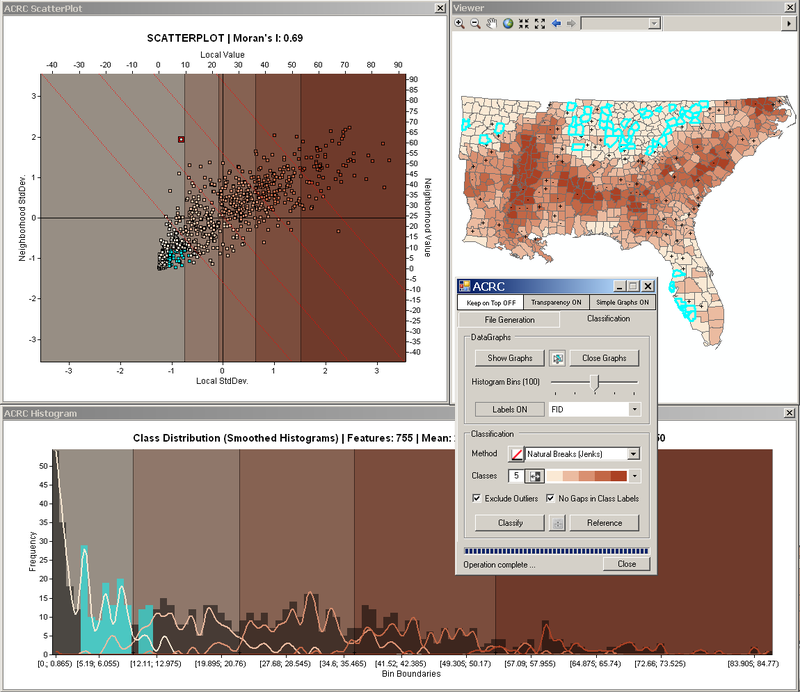 This allows users to enhance the functionality of any ArcMap installation with a novel classification approach that leads to less complex and much easier to communicate spatial patterns in maps. In addition, users are given extended opportunities to explore and better understand spatial as well as attributive relationships within their data. The University of Salzburg's Center for Geoinformatics (Z_GIS) is a member in the Esri Development Center (EDC) program, which provides recognition and special status to university departments that have exemplary programs focused on educating students to design and develop GIS applications using Esri's technologies. Christoph is continuing a tradition of excellence established by previous recipients of this award (Mariana Belgiu and Bernhard Vockner), and thus serves as an outstanding role model for future generations of Geoinformatics students in Salzburg! 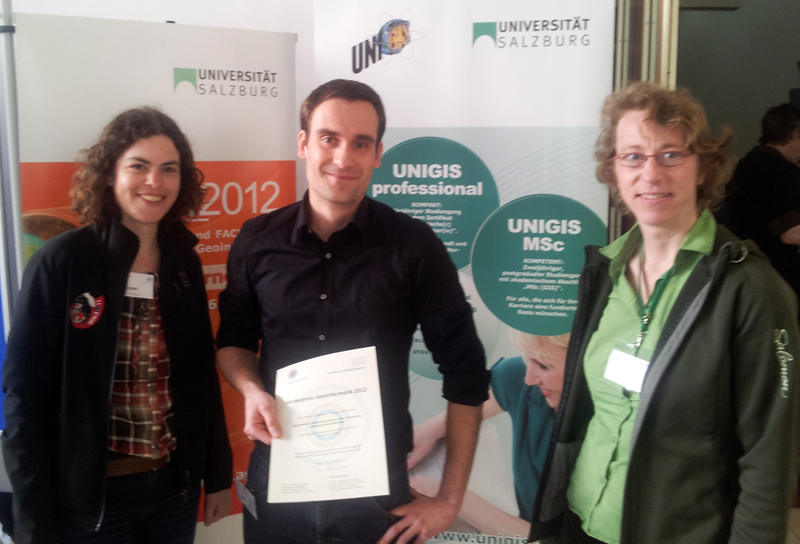 UNIGIS graduate winning top award at RTM! 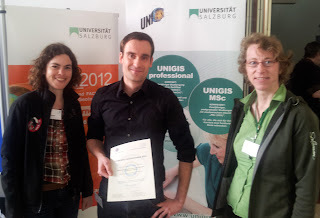 Today, UNIGIS Salzburg alumn Matthias Boedecker received the 1st prize for his excellent Master Thesis “Koordinierung thematischer Klassen unter Verwendung kartographischer Relationen”. Congratulations, Matthias, for this success, combined with best wishes for your professional future! She/he will also be expected to support PhD candidates through critical discussions and with thesis development advice. Review of candidates will begin from August 2011 and continues until the positions are filled. Candidates must have a Ph.D. in a relevant field at the time of appointment. These positions are particularly suitable for sabbaticals or for early/mid career international teaching experience. Please send electronic versions of a current Curriculum Vitae, a statement of teaching interests and experience, and a letter of motivation to: giscience@sbg.ac.at. Please clearly indicate if you apply for the summer term 2012, winter term 2012/13 or both! Teaching for each of the semesters will include two classes with typically three contact hours/week each. A minimum of eight weeks physical presence in Salzburg is required for either semester. The salary will be competitive and travel-related and expenses to and from Salzburg and housing expenses will be paid. Der Runder Tisch GIS e.V. veranstaltet in Kooperation mit der Technischen Universität München das 17. Münchner Fortbildungsseminar Geoinformationssysteme vom 12.-15.03.2012 an der Technischen Universität München.